Considering the ecological disaster that was the collapse of the Northern Cod biomass, one might think that World Ocean Day might enjoy a much higher profile in this province. Our Oceans provide 80% of our oxygen as well as food and medicine but are in dire peril. We continue to dump chemicals into the ground and into our drains. We continue to spew billions of litres of raw sewage into our waterways. The amount of plastic in the Pacific, Atlantic and Indian Ocean is astounding. 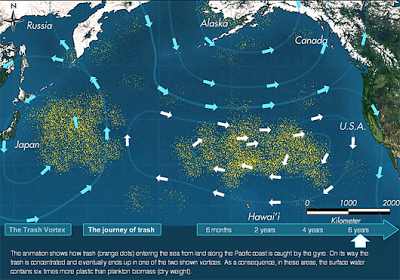 I have tried to highlight the problem of trash in the ocean through a number of posts about the Great Pacific Garbage Patch, and more recently the Atlantic Garbage Patches. Our Oceans are our life giving place. Their role in producing Oxygen is continually undermined by the escalating threat of CO2, garbage, raw sewage, pollution and over-fishing. What can we do as individuals and organizations? We can demand our local politicians develop more environmentally friendly alternatives to transportation. Instead our leaders refuse to adopt emerging green technologies like electric vehicles. Instead of developing sustainable bike trails, our leadership seems intent on rolling back previous initiatives. Plastic is believed to constitute 90 per cent of all rubbish floating in the oceans. The UN Environment Programme estimated in 2006 that every square mile of ocean contains 46,000 pieces of floating plastic. Modern plastics are so durable that they are not breaking down in the environment, creating an environmental nightmare and a hazard for sea mammals and fish. The Robin Hood Bay Dump dominates the scenic skyline along the Sugar Loaf Path along the East Coast Trail. The woods are littered with plastic bags and containers. Why do we continue to allow waste facilities to be located on our coastlines? Still with Robin Hood Bay, which has grown from the City of St. John's Dump to the regional landfill for all of the Avalon, Burin and Bonavista Peninsulas. Did you know that all of the leechate collected at the dump is rerouted into the city's sewer system and is deposited in the harbour via the River Head Wastewater Treatment Facility? The original design of the expanded dump was to include a facility to pump and treat hazardous leechate at the waste facility. A cost saving initiative saw the treatment facility scraped. Instead this environmentally hazardous substance is piped -via the sewer - to the harbour! What is Leachate? 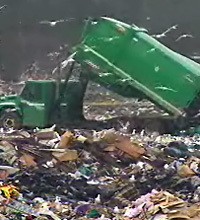 Landfills receive a mixture of municipal, commercial, and mixed industrial waste.The smelly hydrogen-, nitrogen- and sulfur-rich chemical soup is a by-product of the decomposition process. In the past, before the installation of liners, the leachate leaked out into the Atlantic Ocean just below the dump. There is still some leakage but the majority of the Leachate is now collected in specially designed collection ditches that ring the dump. It is collected by pumps and sent to the harbour! Plastics are devastating the environment across the world. We use the longest lasting materials for the shortest time. Wherever possible, we must challenge a throwaway culture that uses non-biodegradable materials for disposable products. At the very least, as we need to use less and dispose of it better. Start making a difference where you live. Inaction is no longer acceptable. In closing, think about your personal footprint on our oceans and make a commitment to reduce it.